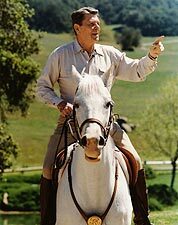 Official White House portrait photo of President Ronald Reagan, taken in the White House, Washington, D.C.
Classic photo of Ronald Reagan riding his horse El Alamein at Rancho Del Cielo. 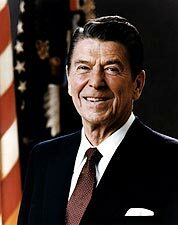 Reagan was the 40th President of the United States, serving two terms of office from 1981 to 1989. A classic patriotic photo of Ronald Reagan speaking at a rally for Senator Durenberger. 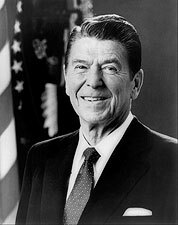 Reagan was the 40th President of the United States, serving two terms of office from 1981 to 1989. Buy Real Museum Quality Ronald Reagan Photos For Sale Online at Poster Store Prices! Our Ronald Reagan pictures are masterfully restored and available for purchase as museum quality Ronald Reagan prints on archival Kodak Endura Professional photo paper (not inkjet prints). 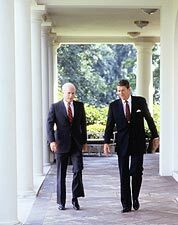 We also offer custom print services, mounting and stock image licensing of these Ronald Reagan pictures, as well as historic picture research. Photo of President Ronald Reagan giving a speech on the Centennial of the Statue of Liberty, Governors Island, New York. 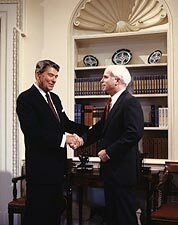 Photo of President Ronald Reagan shaking hands with Arizona Senator John McCain. Former First Lady Nancy Reagan follows the horse-drawn caisson carrying former President Ronald Reagan's flag-draped casket as it proceeds to the Nations Capitol, where he will lie in state in the Capitol Rotunda. 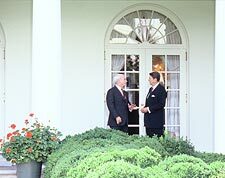 Photo taken at President Ronald Reagan's funeral of Capt. 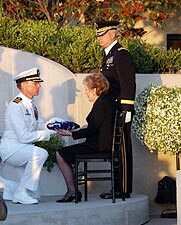 James A. Symonds presenting the casket flag to former First Lady Nancy Reagan during internment services held at the Ronald Reagan Presidential Library. 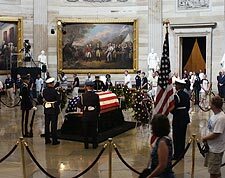 Photo of President Ronald Reagan's casket in the U.S. Capitol Rotunda as visitors pass during the public viewing. Honor Guard members from all branches of service stand guard over the casket. PHOTOGRAPHER / CREDIT: USCG, Telfair H. Brown, Sr.
Photo of members of the Joint Chiefs of Staff saluting former President Ronald Reagan's flag draped casket during the State Funeral procession in Washington D.C. Reagan served as the 40th President of the United States from 1981 to 1989. Photo taken at the former President Ronald Reagan funeral of the Old Guard Caisson Platoon carrying the casket of former president, as members of the Joint Service Honor Guard stand by on the steps of the Capitol in Washington D.C.
Photo taken at the former President Ronald Reagan funeral of the Old Guard Caisson Platoon and the former presidents flag-draped casket during the State Funeral procession from the White House to the Capitol in Washington, D.C.
Official presidential photo of Ronald Reagan, the 40th President of the United States. Reagan served as president from 1981 to 1989. 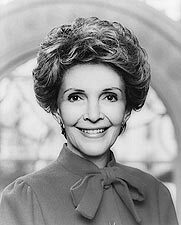 Nancy Reagan, wife to Ronald Reagan, the 40th President of the United States. 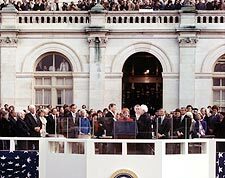 Chief Justice Warren E. Burger administers the presidential oath of office to Ronald Reagan on the west front of the U.S. Capitol. 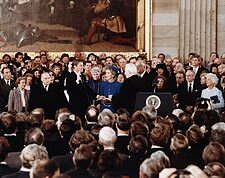 Photo of President Ronald Reagan and Chief Justice Warren E. Burger administering the oath of office to the new President in the rotunda of the U.S. Capitol, January 21, 1985. 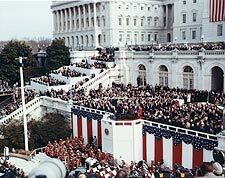 Photo of President Ronald Reagan at his Inauguration on the west front of the U.S. Capitol, with the Washington Monument in the distance, January 20, 1981. 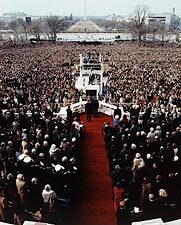 Photo of President Ronald Reagan delivering his inaugural address on the west front of the U.S. Capitol, January 20, 1981. Photo of Pres. 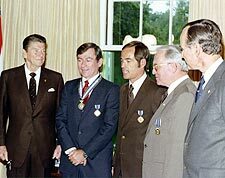 Ronald Reagan presenting Astronaut John Young with the Congressional Space Medal of Honor as well as NASA's Distinguished Service Medal. Robert C. Crippen also received the Distinguished Service Medal. 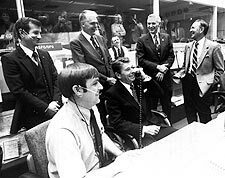 Photo of President Ronald Reagan in Mission Control asking STS-2-2 Astronauts Joe Engle and Richard Truly if they could stop by Washington en route to their California landing site so that he might come along. 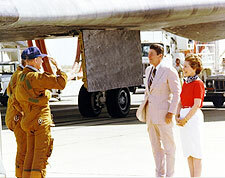 Photo of Columbia Space Shuttle Astronauts Commander Thomas K. Mattingly and Pilot Henry W. Hartsfield saluting President Ronald Reagan and his wife, Nancy, as the astronauts begin the customary walk-around inspection of the orbiter after landing. 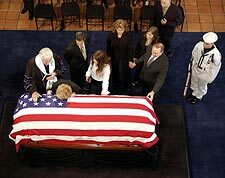 Photo of Nancy Reagan laying her head on the flag-draped mahogany casket of her husband, former President Ronald Reagan during a service at the Ronald Reagan Presidential Library in Simi Valley, California. 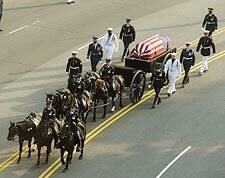 Members of a joint honor guard carry former President Ronald Reagan's flag-draped casket to a horse-drawn caisson for the funeral procession in Washington D.C. Reagan served as the 40th President of the United States from 1981 to 1989. 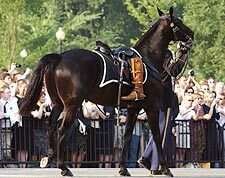 A riderless horse follows the caisson bearing former President Photo of Ronald Reagan's flag-draped casket during his funeral procession in Washington D.C. A pair of President Reagan's boots are reversed in the stirrups of the empty saddle. 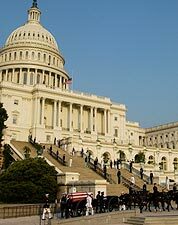 The horse-drawn caisson carrying former President Ronald Reagan proceeds to the Nation's Capitol, where he will lie in state in the Capitol Rotunda. 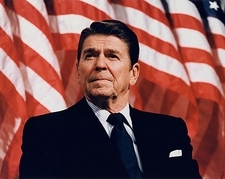 Reagan served as the 40th President of the United States from 1981 to 1989. 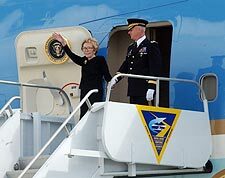 Ronald Reagan funeral photo of Former First Lady Nancy Reagan bidding farewell to on-lookers before boarding the VC-25 Special Airlift Mission (SAM) 2800 747 aircraft. Photo of Ceremonial Guardsmen carrying the flag-draped casket of former President Ronald Reagan from a hearse after arriving at Naval Base Ventura County, Pt. Mugu, Calif.
Ronald Reagan funeral photo of the Ceremonial Honor Guardsmen carrying the flag-draped casket of the former President to the VC-25 Special Airlift Mission (SAM) 2800 aircraft during a departure ceremony at Point Mugu, California. 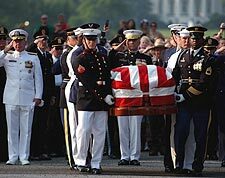 Photo of Members of the Ceremonial Honor Guard carrying the casket of former President Ronald Reagan after it is removed from the VC-25 Special Airlift Mission (SAM) 2800 747 aircraft. 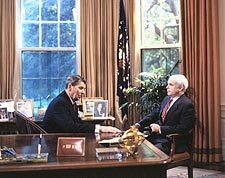 Photo of President Ronald Reagan and republican senator John McCain of Arizona at the White House in the Oval Office in Washington, D.C.
Photo of President Ronald Reagan and republican senator John McCain of Arizona at the White House in Washington, D.C.
White House photo of Senator John McCain and President Ronald Reagan. 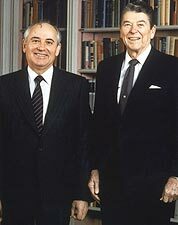 Photo print of U.S. President Ronald Reagan and Soviet General Secretary Mikhail Gorbachev posing for official photos in the White House Library on Dec. 8, 1987. The two leaders signed the Intermediate-Range Nuclear Forces (INF) Treaty on this date. 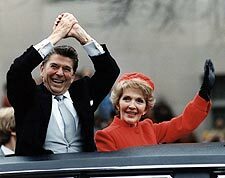 Ronald Reagan photo showing Reagan and his wife Nancy waving to the crowd from their limo during the 1981 inaugural parade.